Today, I saw Michelangelo’s David at the Galleria dell’Accademia in Florence, Italy. Walking around the corner of the amazingly beautiful gallery and being stopped in my tracks by the sheer magnitude and awe I experienced when I first caught a glimpse of David is a moment I will never forget. Never mind the tourists buzzing around like bees, taking pictures, and communicating in a culmination of diverse languages, nothing else mattered; when I first saw David, everything was quiet. I felt as if I was a part of some great secret, like I had a glimpse into something spectacular only few – and with me being a measly 19-year-old student, I felt drastically inadequate – should ever be a part of. Marble may be but a rock, but Michelangelo’s David, composed of 17 feet of solid marble stature, is a marvel in history, not only by art standards, but by the cultural purpose it provided for Italy and the whole world. The Brain & The Experience of Beauty in Art students appreciating David at the Galleria dell’Accademia in Florence, Italy. Michelangelo’s David was and still is revolutionary; modern artists even today, some 500 years in the future, look up to the great Masters of Art and culture like Michelangelo, and hold David as a piece renowned for its depiction of beauty and pure aesthetic perfection. 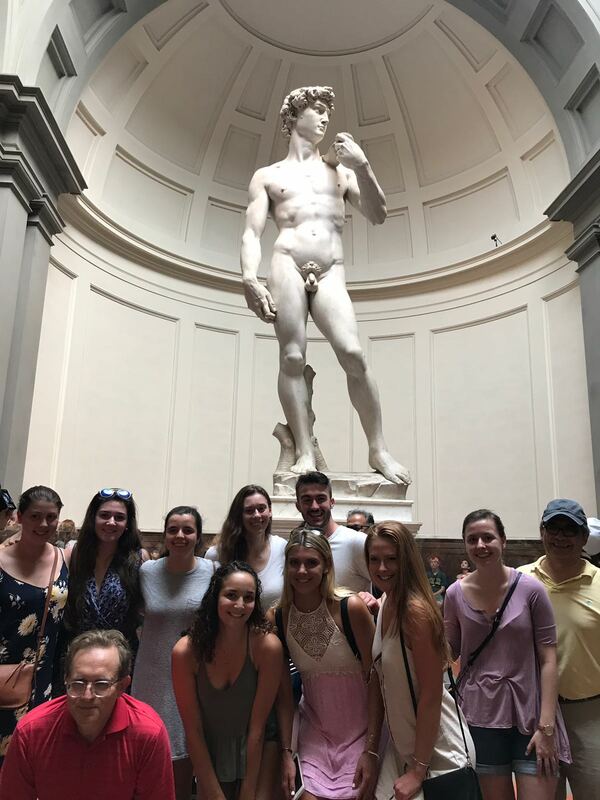 I may have awed and froze at the sheer beauty of this large, naked man, but David opened my eyes to the changing of times and the clash of cultures from ancient to modern civilizations. As I took in the scene before me, of an ancient relic of supreme artistry contrasted against the bustling of people surrounding me, some taking pictures and selfies in front of this artistic treasure but never really stopping to acknowledge all that the statue stood for and appreciate how innovative and ahead of the times this piece of artwork was, it was shocking how much the culture of our world has changed since 1501-1504 when David was created. However, it is comforting to note that while so much has changed, the majority of one’s appreciation for great artwork is the common thread binding us all together as one people. 1 Comment to "Michelangelo’s David: So Much More than a Large, Naked Man"